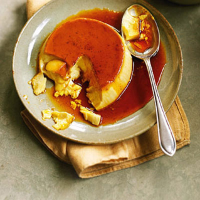 This pudding can be made with lemon instead of orange; either way, the citrus adds a haunting wisp of flavour. It is also possible to prepare it in a deep soufflé dish to make a single large pud. Split the vanilla pod lengthways; scrape the seeds into a pan and add the pod, orange zest and milk. Bring to the boil, take off the heat; leave to infuse for 1 hour. Preheat the oven to 150C/gas 2. Put 150g sugar in a heavy-based pan with 100ml water. Heat gently until the sugar dissolves, then bubble over a high heat until it is caramelised. Pour the caramel into 6 ramekins. Leave to set. Whisk 3 whole eggs, 6 egg yolks, the remaining 125g sugar and the Cointreau together in a bowl. Reheat the milk to just below boiling point, remove the vanilla pod and gently pour over the egg mixture, beating all the time. Strain into another bowl, and allow the foam to subside for a couple of minutes, removing any that remains with a slotted spoon. Put the ramekins in a deep roasting pan; divide the egg mixture equally between them, then carefully fill the roasting pan with boiling water to come halfway up the ramekins’ sides. Put in the oven and bake for about 1 hour 30 minutes, until just set.